This past Monday marked the 193rd anniversary of Bolivia’s independence. In Potosí, more than 25 opposition groups gathered to disrupt the official celebrations. They arrived under the banner of the “F21 2016 Movement,” named for Feb. 21, 2016, the day that voters across the country rejected president Evo Morales’ proposal to change term limits, allowing him to run indefinitely, by a 51.3 to 48.7 percent margin. Despite the “no” result, the Bolivian constitutional court annulled the referendum and Evo announced his bid for a fourth term in November 2017. Since then, the F21 movement has grown. The protestors that flooded Potosí’s plaza on Monday did not represent a unified political front. Ranging from groups called “Another Left is Possible” and “Bolivia Promised Me” to mining syndicates from the sierra and coca leaf farmers from the lowlands, they denounced the prospect of Evo’s re-election from a diverse array of ideological and political motivations. Within Bolivia and within the international community, Evo has garnered critics from both the right and the left—which makes discussing his legacy and his agenda a complicated prospect. 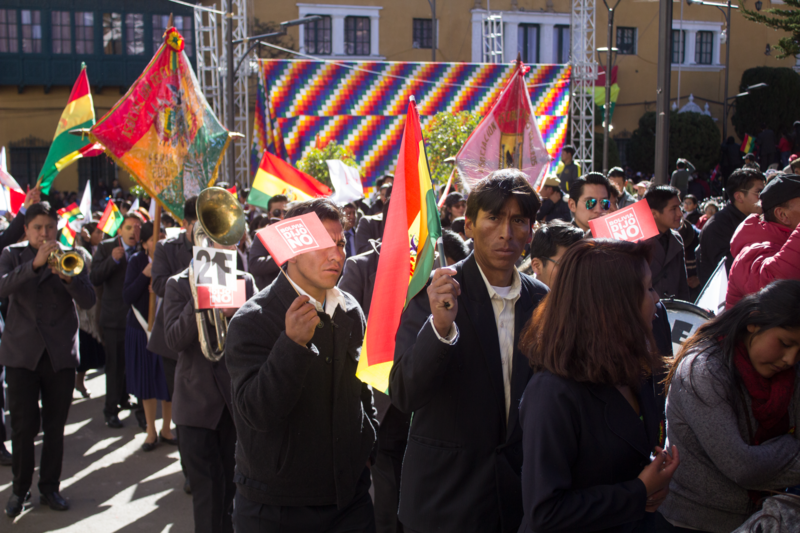 From its flora and fauna to its political and social movements, Bolivia is in many ways a land of extremes—and the current pushback against Evo Morales is no exception. A good portion of the F21 movement are right-wing neoliberal actors who have been anti-Evo and anti-MAS since he came to power in 2006. This includes politicians and businessmen from Bolivia’s eastern-bourgeois bloc in the lowlands, which consolidated itself between October 2003 and June 2005 in an effort to counter left-Indigenous agendas espoused by Evo during the Gas Wars and the overthrow of ex-president Gonzalo Sánchez de Lozada. These people were against the nationalization of natural resources in Bolivia, and felt that Evo’s agenda threatened their hydrocarbons-rich departments. These critics also consist of mestizos in the sierras who feel threatened by Evo’s Indigenous agenda, as highlighted by violent anti-Indigenous uprisings in such places as Cochabamba in 2007 and Sucre in 2008. The discourse from the right against Evo today is strikingly similar to 12 years ago—which in part explains why Evo’s rising front-runner is Carlos Mesa, a U.S.-backed and neoliberal candidate who was the former vice president of Goni. On the other end of the political spectrum, another breed of Evo critics are prior-sympathizers-gone-dissidents who feel that Evo has not stayed true to his socialist experiment. According to this discourse, which is often laced with a tone of mourning, Evo is in reality not much different than his neoliberal, extractivist and capitalist predecessors. Critics point to MAS-supported massive foreign mineral exploration, dam projects in the northern Amazonian states of Beni and Pando that have been approved by the government despite continuous Indigenous protest, and the the construction of the national highway in the Isiboro-Sécure Indigenous Territory and National Park (TIPNIS) despite Indigenous and international protest as exemplars of Evo’s hypocrisy. To critics on the left, Evo’s international enshrinement of the Rights of Mother Earth, as well as his pro-Indigenous and decolonial rhetoric which characterize everything from his new 2009 plurinational constitution to his tweets, are not much more than empty gestures for political gain. Although Evo’s support is at an all-time low, as reported in a series of surveys in the La Paz-based newspaper Página Siete on July 29th, roughly 27% of Bolivians say they would elect Evo for a fourth term. Under Evo for the last 12 years, Bolivia has undergone incredible growth in various sectors such as economic growth, literacy rates, improved public health, and education initiatives. Perhaps most importantly, the majority-Indigenous country has enacted a series of unprecedented pro-Indigenous language and education policies—improving innumerable Indigenous peoples’ lives for the better. Although Evo’s support is no longer at the majority it enjoyed for over a decade, his base is still as loyal as ever—and intends to counterprotest any moves to remove Evo’s bid in 2019. On Monday morning, protesters found that by 7 AM, all entrances to the plaza were blocked by police barricades and only a select few were permitted entrance. It was not until the afternoon, when the official ceremony was over and the police disbanded, that the protesters could flood historic Potosí’s 10 de Noviembre plaza to denounce their president, documented in the following photo series. Potosí is often considered a shell of its former self, but Monday's vibrant parades and packed streets recalled the colonial mining hub's 17th century heyday. The opposition groups that travelled to Potosí on Monday are part of the “F21 2016 Movement.”—The official military parade, held Monday morning. In 193 years of Bolivian independence, this was the first time independence ceremonies were celebrated in Potosí. The opposition groups, known as "platforms" in Bolivia, traveled to the city of Potosí from all nine departments of Bolivia. "United for Potosí," the sign reads. Two friends begin to exit the plaza as the protests start to wind down. "Bolivia te quiero libre con democracia" ("Bolivia I want you free and with democracy") reads one of the protester's shirts. Despite being forced to wait for over three hours to enter the plaza, many protesters were in high and celebratory spirits. A pile of "Bolivia dice sí" (Bolivia says yes) pro-government hands, torn up and discarded in an alley. If elected in 2019, President Evo Morales would remain in office until 2025, a term of 19 consecutive years. As 2019 approaches, the "F21 2016" movement will undoubtedly host more massive protests. One likely date to look out for is November 29, the anniversary of when the Bolivian constitutional court abolished re-election limits. Another is, of course, February 21—also sometimes referred to as "El día de la mentira" (The day of the lie). Jacquelyn Kovarik a Foreign Language Area Studies (FLAS) Fellow at New York University, where she is studying Quechua and pursuing a Masters degree in Latin American Studies and Journalism. Her research focuses on contemporary social change in Bolivia and Peru, with an emphasis on transitional justice and initiatives for well-being and resilience in Andean communities. On the country’s 193rd birthday in Potosí, Bolivians remain split on president Evo Morales’ decision to dissolve term limits, as an opposition movement grows.